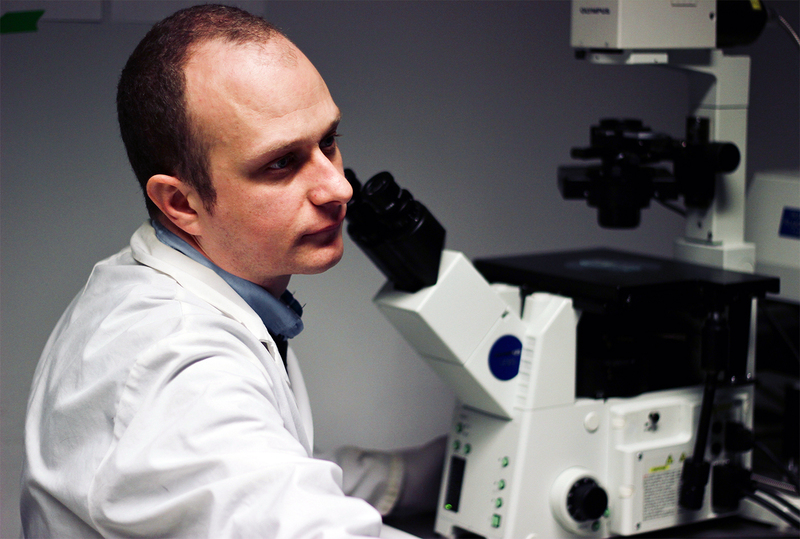 By studying worms, PhD student Daniel Merritt, pictured, aims to uncover the cells and molecules behind learning and memory (Photo by Jovana Drinjakovic).. Try as you might, some events cannot be remembered. Known in psychology as memory blocking, the phenomenon has remained elusive since first described more than half a century ago. Now Donnelly Centre researchers have found that blocking is not due to problems with forming memories, as previously thought, but with memory recall—in worms at least. By studying this process in the C.elegans worm—a creature only one millimeter long but whose biology has been studied so extensively that the position of all of its 302 nerve cells in the body is known—the researchers believe they will be able to pinpoint the cells and molecules at play. 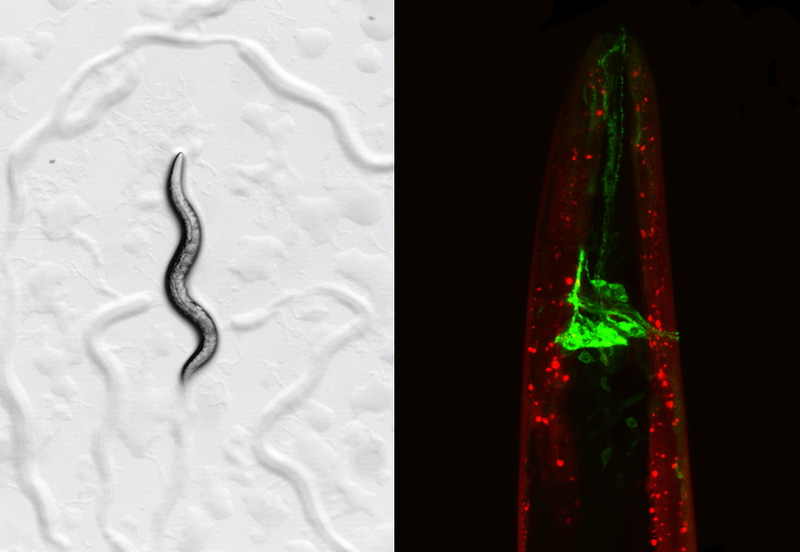 The C. elegans worm crawling on the surface of a petri dish (left); a high magnification of the worm head with a single olfactory neuron labeled in green (Daniel Merritt). This is possible thanks to a vast genetic and molecular toolbox that are available to researchers working with C.elegans. But first, Merritt had to establish that memory blocking occurs in worms, which has not been studied before. Next, Merritt gave the benzaldehyde-trained worms benzaldehyde together with salt. When he then exposed the worms to salt alone, they still crawled toward it. The same was true when salt-trained worms experienced salt together with benzaldehyde—they continued to like almond smell. Whichever cue came second, and in conjunction with the first one, was blocked, similar to what happens in rats and humans. The EGL-4 protein is present in a single olfactory nerve cell in the worm’s head and its movement inside that cell is required for benzaldehyde starvation learning. To Merritt’s surprise, the protein shifted its position during benzaldehyde blocking the same way it did during normal learning. This suggests that the memory of disliking benzaldehyde had formed but could not be retrieved—the worm forgot about it.